The Oscar Madness Continues - EPNER TECHNOLOGY INC.
By this time all of you should know that this year’s Oscars were plated with our proprietary 24 Kt,.Laser Gold process. I live in Brooklyn Heights which is Landmark Preservation District settled in the early 1800s, and the Greek Revival houses and cobbled stoned streets make the neighborhood a venue often sought out by moviemakers. 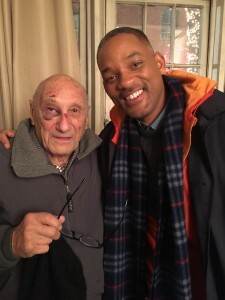 Recently a movie called “Collateral Beauty” starring Will Smith, planned three days of filming on my street. Indeed, they offered to pay me a few hundred dollars if they could decorate my house with Christmas lights and wreaths, and after a short negotiation on price, I agreed. 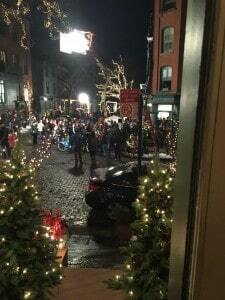 They were shooting at night and it seemed that the whole neighborhood poured onto the street to watch. I was among them. I stepped over the power cables and around the snow that had been manufactured by a giant truck that ground up huge blocks of ice, and then fell right on my face into the gutter, glasses flying. Four of the movie crew rush over to help me up and with blood streaming down my face they sat me on down my front steps while calling for their on-staff Medic to administer first-aid. “You’re going to need stitches”, he said, as he swathed my head in gauze. The next sound I hear is the ambulance arriving. My tenant and her architect husband have lived in the house for years and she insisted on accompanying me to the hospital There is a satellite emergency room of NYU hospital nearby and when we arrived the ambulance drivers walked me into the emergency room.. The doctor asked what happened and I told him, “Three Irish guys jumped me” I was wising off to try to indicate that I was not badly damaged but they insisted on a CAT scan of my head and an x-ray of my hand. Seven deftly administered stitches later, the wound over my right eye was closed. After almost three hours, they were ready to let me go home and my charming tenant and another neighbor, both of whom stayed with me the whole time, succeeded in cajoling the EMT drivers to wait around for the return trip. I gratefully accepted their ride back to the house but I told them, “This this time I want the “Full Monty”… Sirens, lights, everything.” It was a wonderful homecoming! After a good night’s sleep I was fine and the following evening I thought it would be fun to let the movie guys know that their “patient” was the guy who actually gold plated this year’s Oscars. Between scenes, I sought the director, David Frankel. I apologized for the previous night’s disruption, and presented him with the “Oscar Penny”, of course accompanied by the story: “The gold on the penny I’m handing you was plated in the same tank as the Oscars”. I said, I’d like to give one to Will Smith in order to greatly increase his odds of winning the Oscar for his performance in this movie. Frankel loved the idea and introduced me to Will who thanked me and offered to pose for a “selfie”. I took him up on it of course and as I left he suggested that I also give an “Oscar Penny” to the producer of this film, Michael Bederman, since he had just been awarded one of the “Epner” Oscars for being the producer of “Spotlight”, which was named Best Picture this year. Bederman took the same delight as the others receiving his Oscar Penny and I embellished the story a bit by telling him the relationship of Laser Gold to the Space Program and more recently to the James Webb Space Telescope. This entry was posted in Uncategorized on March 29, 2016 by David Epner. My father has worked for you ever since I was a baby! Now i am the good age of 35. What a delight to read your story. My father loves what he does and takes great pride as you do! Thank you for letting us into your world for a brief moment in your life. God bless you! David….you never cease to amaze me! My PR guy says “you want to blog” and I show him you with Will Smith. How can I compete? Keep it going; it’s a great read. SPIE honors me with the "Midas Award"….Midas Award?? Another Laser Gold Serendipity Story?…. Give us a Break!